I’ve never been to Wrigley Field. It must be pretty nice, what with the ivy and all. Built in 1914, it has been the home of the Chicago Cubs for 99 years. Only Boston’s Fenway (1912) is older. I’d like to visit Wrigley some day, but not in March. Because it’s cold. And, it snows. And, there are no Cubs there in March. But, back to Spring Training … and #4 on my list of most amazing Spring Training locations (mascot, optional). In the early years, most teams were virtual nomads, wandering from whatever college or minor league park in the south might accommodate them for a few weeks each spring. They bunked en masse in fraternity houses or cheap hotels, and dined at boarding houses overseen, I gather, by plump, elderly widows dishing out the morning grits. Now, imagine if your owner bought an island – an entire island! – and then plopped you and your teammates right down in the middle of it. Who cares if the nearest other team is THOUSANDS of miles away? This is Paradise, Baby! 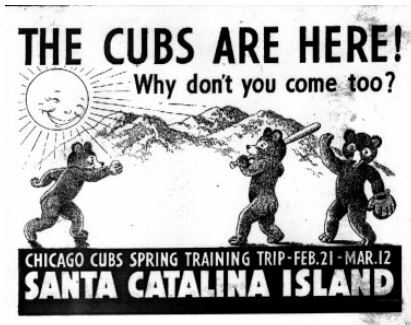 And, so, when Chicago Cubs owner William Wrigley shelled out about $3 million for Santa Catalina Island, 25 miles off the coast of California, in 1919, he packed up his Cubbies and shipped them off to Xanadu. Dodgertown? It’s a TOWN. The Cubs had an island!